Jose Mourinho aimed a Christmas Day dig at Manchester City, claiming the runaway Premier League leaders have been handed an unfair advantage by playing their next match more than a day later than his United team. United welcome Burnley to Old Trafford on Tuesday but City, who have a huge 13-point lead over their city rivals, won’t play again until Wednesday night when they travel to Newcastle. Last Saturday’s 2-2 draw at Leicester was the first of four top-flight games in 10 days for United. “I’m not just saying about the privileged teams with six days to recover and to enjoy and to prepare for the next one, but also the ones with a little bit more (time) than us, for example the ones that play after tomorrow — that extra day means a lot,” Mourinho told Sky Sports News. “It means probably they are not working today, it means they can be back to work tomorrow and prepare for the next day. The problem that I see here is the difference between some teams. “But what I call the December injuries in English football are arriving. Some players are leaving the pitch after 15-20 minutes, some others don’t resist for the 90. Mourinho also admitted that Christmas had been a tough time for him as it was the first one since the death of his father, former Portugal goalkeeper Jose Manuel Mourinho Felix, in June. “It’s the first Christmas without my father and I think that’s the most difficult one,” he said. 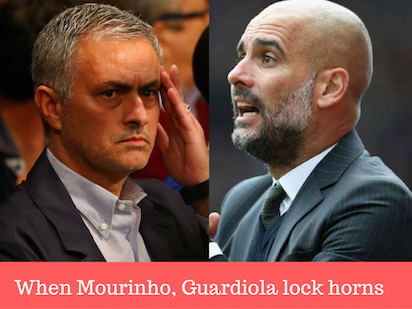 The post Mourinho takes dig at City’s ‘extra day’ appeared first on Vanguard News.